I had my GXP remotely tuned one week ago, and would like to post my experience since their aren't many threads detailing the process. I don't believe I can mention the vendor as they are not a supporting vendor of the forum, but feel free to PM me if you would like to know. Anyway, for my particular tune, I was sent a loaner laptop and HP Tuners MPVI device. I made an appointment, and connected the laptop to my hotspot (home internet was too strained by the garage). When it came time for the appointment, all I had to do was have the laptop connected to wifi and the car via the ODBII port. The tuner remotely controlled the laptop. The car's stock tune was read, then I was instructed to take a baseline data log. Next, the custom tune was written to the car, and another data log run was performed. Afterward, since everything was running as expected, the tuning was completed. Overall it took around an hour, and the car feels, and is, noticeably quicker. As others on the forum have stated, third gear is a monster. Definitely worth the <$400 price. I plan to take the car to a dyno to get some pulls graphed just for the fun of it, as I don't have a baseline dyno run to compare my particular car to. I'll post the results when I have them. easyryderca, lexpioneer and Saveaux like this. We all know the source of your tune. Its ok. Many have had their cars tuned by Martin. raygun and Saveaux like this. 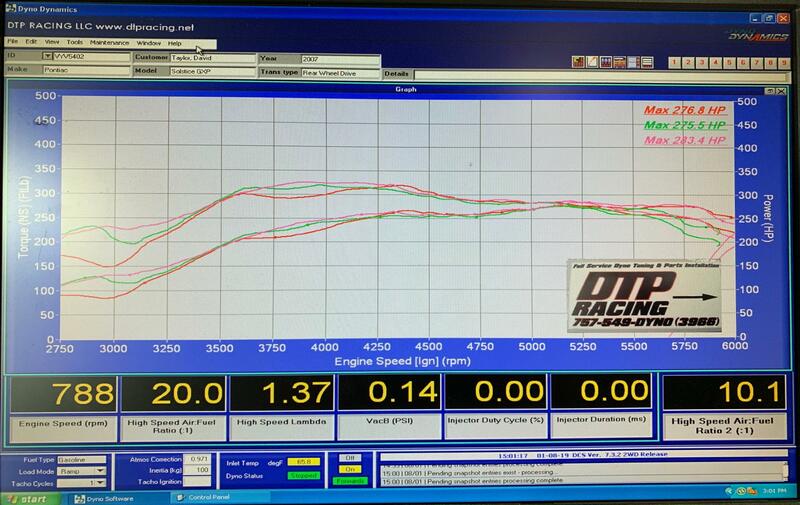 Ending up making 283.4 hp and ~320 lb ft of torque at the wheels on a Dyno Dynamics dyno, temperature was 65 degrees, humidity of 65%, and at sea level. Of course these numbers should be taken with a grain of salt, especially since I don't have any prior runs to compare these to, but they are at least fun to see. Very similar to mine, but mine continues to pull and even jumps a bit around 6500rpm. I have my redline set to 7k....or I don't have one....whatever the tuner decided...LOL.... I've never pushed my car past 6k with the new tune. Old one, I was around 7k when I let off....new tune...no. Supposedly mine is "conservative". Last edited by The_Ghost; 01-08-2019 at 07:06 PM. That is about 325.74 at the flywheel.